Rainbow trout is a nutritious and delicious fish and cooking it couldn’t be easier. 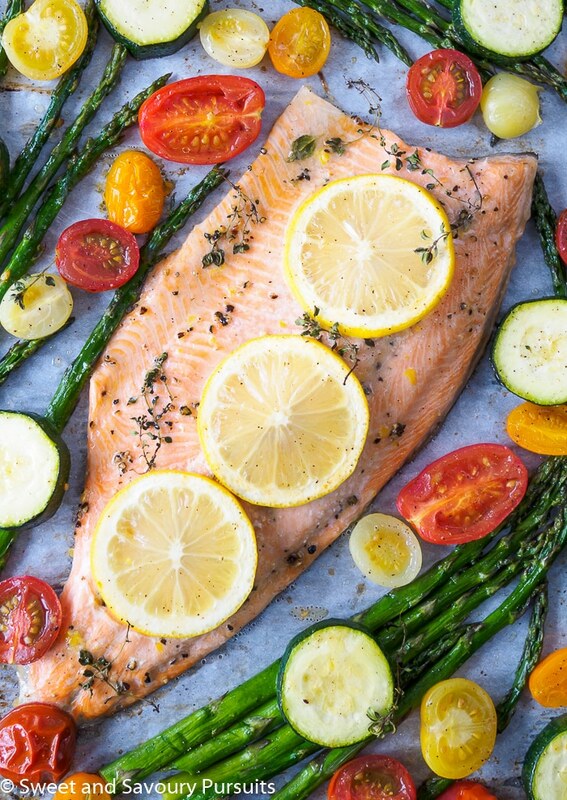 Here’s a healthy and simple recipe for Baked Rainbow Trout Fillet with a side of vegetables that can be prepared and cooked in under 30 minutes! Even though I love to cook and would be happy to spend all day in the kitchen, the reality is life’s too busy and that’s just not possible. I need delicious and healthy meal options that can be prepared in just about 30 minutes and seafood is a great option for getting nutritious meals on the table quickly. 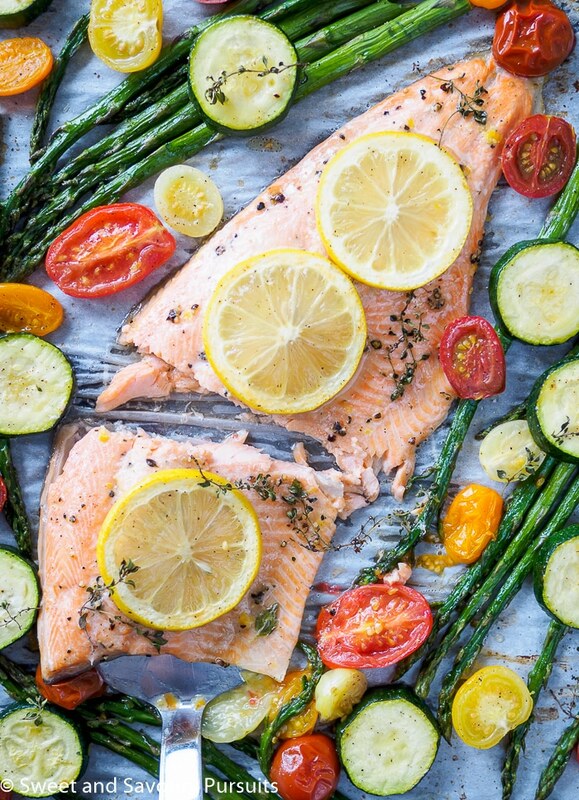 For example this Baked Rainbow Trout Fillet with a side of veggies is an easy recipe that can be quickly baked in the oven. This dish is healthy, light, flavourful and easy to make. What’s even better about this meal is that you can bake the fish and a side of vegetables all on the same baking tray in the oven. It’s perfect for those busy days when you don’t have much time to cook. How to cook rainbow trout fillet and for how long? Cooking rainbow trout fillets in the oven is easy. Start by preheating your oven to 425°F. If you are cooking the trout on its own, you can wrap it in foil or parchment paper to keep it moist. When cooking it with the vegetables, as I do in this recipe, all that you’ll need to do is line the baking tray with foil or parchment paper. I check my trout fillets at 10 minutes, especially if the fillets are thinner and on the small side, to make sure I don’t overcook them. You know the trout is properly cooked when the fish flakes easily at the thickest part of it (use a fork or knife to check). If the trout flakes easily it’s cooked, if not, return it to the oven and bake for a few more minutes before checking again. What to serve with rainbow trout fillet? For this recipe, I chose asparagus, cherry tomatoes and zucchini to bake with the rainbow trout fillet. The asparagus actually takes about 5 minutes longer to cook than the trout does, so when getting your meal ready start with the asparagus. Choosing pencil thin asparagus will ensure they cook quickly. Get the asparagus ready and bake them in the oven for 5 minutes before adding the rest of the vegetables and rainbow fish to the tray. Put the tray back in the oven and in just about 10 minutes you will have perfectly cooked trout and veggies! Additional options for sides that cook or can be prepared quickly include whole wheat couscous — it takes less than ten minutes to cook, just follow the package directions. I like to sprinkle some chopped pistachios onto the couscous just before serving. You can also serve it with a small side of orzo tossed in a pre-made pesto. And if you’re watching your carb intake you can simply serve it with a salad or additional veggies. Enjoy! If you make this recipe be sure to take a picture and share it with me on Instagram by tagging #sweetandsavourypursuits, I’d love to see your photos! A healthy and simple recipe for Baked Rainbow Trout Fillet that can be prepared and cooked in under 30 minutes! 1 fresh rainbow trout fillet approximately 300g. Preheat oven to 425°F. Line a baking sheet with parchment paper or aluminum foil. Start by washing and trimming the tough ends of the asparagus. Drizzle with about 1/2 tsp. of olive oil and sprinkle with a bit of salt and freshly ground pepper. Spread on the baking sheet and bake for 5 minutes. Meanwhile wash and slice the tomatoes and zucchini, place in a bowl and toss with 1/2 tsp. of olive oil and a bit of salt and pepper. Take the trout fillet and pat it dry with paper towels. Drizzle with 1 tsp. of olive oil and sprinkle fish with salt, pepper, lemon zest and dry herbs (if using dry instead of fresh), gently rub the seasonings on the flesh of the fish. 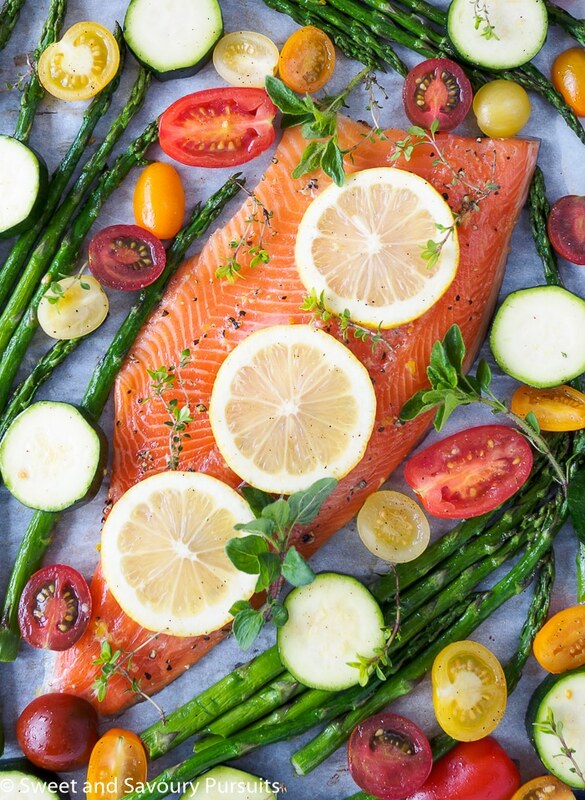 Remove the baking sheet from the oven, stir the asparagus and push them to the sides, place the fish (skin side down) in the middle and the tomatoes and zucchini around the fish. Top the fish with the lemon slices. Return the baking sheet to the oven and cook for another 10 minutes or until the fish flakes easily with a fork. That’s great Steve, hope you enjoyed it! Thank you Erica! This is definitely one of the easiest meals I make! How colourful and beautiful is this!!! Thank you, I also love how colourful this dish turned out to be! Nice fresh flavors and perfect for the rainbow trout. Such a bright and colorful dish. Everything looks so good! Thanks, I also love how colourful this dish turned out to be! That looks fantastic! Lovely photos! Thanks for this recipe. I’m always looking for different ways to prepare trout, and this looks delicious. Rainbow trout – rainbow dish! I just love all of the bright, vibrant colors! And I’m a big fan of trout – can’t go wrong with quick, easy, healthy, and delicious! Thanks Kathleen, you’re right it is a rainbow dish! I almost purchased trout this last weekend, but I wasn’t quite sure how to prepare it…now I do! This looks fabulous and so pretty too! Beautiful presentation! Thanks Nancy! I find rainbow trout tastes very close to salmon, so I think that you can prepare it the same way you do salmon and get tasty results! Oh wow! This looks sooooo tasty!!! Nice job! Thanks Amanda. Hope our paths cross again soon! love this baked trout, perfect for the season and the photos look so pretty. Thank you Thalia, fish is nice and light so it is perfect for warmer weather! I had no idea rainbow trout was similar in color to salmon. It looks delicious. I don’t think I’ve ever had it before. Yes it is similar in colour to salmon and I find that it taste similar as well. It’s widely available here, have you seen it in shops in your area? No I haven’t but then I haven’t really looked now I will. It’s a fresh water fish right? From what I understand is that they spend some time in the ocean but they return to freshwater to spawn. Never in salt water!! They are fresh water only. I live on the shoe of one of the best rainbow trout rivers…salmon can go to ocean and return to spawn..